This is plate ten from James Baillie Fraser's 'Views of Calcutta and its Environs'. Fraser (1783-1856) arrived in Calcutta in 1814 and in six years had produced animated sketches of the busy city. 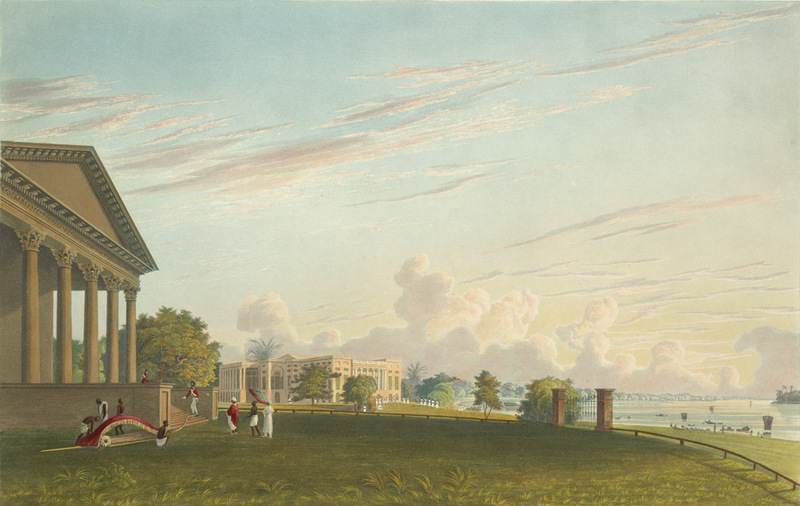 The collection includes two views at Barrackpore. This one shows a house that "the Marquess of Hastings had greatly extended, adding in 1814-15 a whole new storey". In 1801 Marquess Wellesley had taken over as the Commander-in-Chief of the Army's residence at Barrackpore, 14 miles from Calcutta (Kolkata). He built Barrackpore House as a residence for future governors-general. On the left is the Memorial Hall, or Temple of Fame, a memorial to French and Dutch soldiers those who had died in the conquests of Mauritius and Java during the Napoleonic Wars.